Vietnam’s national forest cover is targeted to reach 42% of the total land area, equivalent to 14.4 million hectares, by 2020. 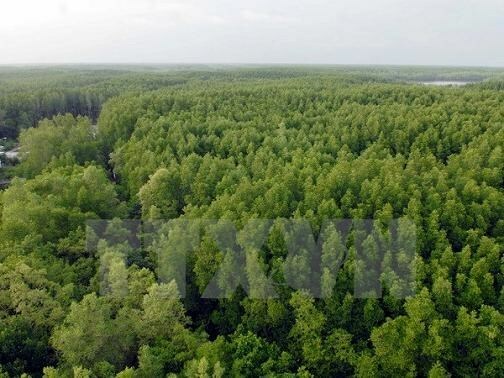 It is among the goals set out in the Prime Minister-approved national programme on reducing greenhouse emissions through the limitation of deforestation and forest degradation, preservation and improvement of carbon reserves, and sustainable management of forest resources (Programme REDD+) until 2030. The programme also seeks to contribute to eliminating greenhouse emissions via REDD+ activities in the next three years, stabilise the area of natural forests by 2030 at least at the same level as in 2020 and increase the national forest cover to 45%, thus contributing to realising the national target of cutting 8% of greenhouse emissions by 2030 compared to a Business-as-Usual (BAU) scenario as committed in the Paris Agreement on climate change. The programme will be implemented on a national scale from 2017 to 2030, prioritising the pressing regions with regard to deforestation and forest degradation, those vulnerable to climate change and those with a high potential for forest carbon reserves. Efforts will be made to review and adjust the forest and forest land use planning, aiming to ensure that 16.24 hectares of forest land are used for forestry purposes by 2020; support the sustainable agricultural and fishery production and prevent deforestation and forest degradation; improve forest administration and livelihoods of the people living in or near forests; and strengthen the enforcement of forestry laws. Additionally, the programme will assess and replicate the models of high-yield forest production and large timber forests; pilot, evaluate and replicate the sustainable natural forest management models; protect, preserve and rehabilitate forests; and improve the economic and financial environment for the forestry sector.